By selling your current home before buying a new one, you’ll know the exact amount you’ll be receiving from the sale. You’ll therefore have a very good idea of how much money is available to buy your new home. You might start feeling an urgent need to find a new home right away. But keep in mind that you’ll already have all the information needed to make your promise to purchase. For example, you’ll know when the buyers of your current home are moving in, and can therefore easily establish when you’ll need to take possession of your new home. If ever the dates don’t coincide, you can always plan for temporary accommodation. When you buy first, you’ll know your new address, the exact price of your new home, the date on which you’ll become owner and the transaction date. You’ll be able to consider these things when you receive a promise to purchase for your current home. You can also make a promise to purchase that is conditional on the sale of your home. In this case, the owner of the property you’re interested in might receive another offer without any conditions. In order to give yours priority, the owner will ask you to withdraw your condition. You will therefore have to decide whether you’d rather buy that property before selling your existing home, or withdraw your offer. One way or another, it’s a good idea to plan a temporary source of financing in case your current home isn’t sold when you sign the purchase contract for your new home. Julio Borsellino is a Concordia University graduate in Economics. 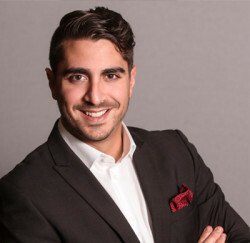 He has been working with people throughout his career and has been fully dedicated to the real estate industry since 2011. Through his many years working in sales and directly with people, he’s learned to develop certain abilities that are essential to offering the best possible service to his clients.